BRIDGETOWN, Barbados – A blistering knock from Captain Darren Sammy led west Indies to a five wicket win over England in the second T20 International at Kensington Over here on Tuesday. The win ensures West Indies have secured the three-match series following Sunday’s win and with one match remaining. Sammy took charge hitting two sixes and smashing three fours to race to 30 in just nine balls, swinging the match back in West Indies favour after England had made some inroads by taking quick wickets and suppressing the run rate. Sammy’s men reached the target with seven balls to spare after England, who won the toss and chose to bat, were restricted to 152 for 7, undermined by Jamaican seamer Krishmar Santokie who finished with an outstanding four wicket haul. Santokie led the onslaught by removing opener Michael Lumb and frontline batsman Moeen Ali for single digits to throw the England innings into disarray at 26 for three. But a fourth wicket partnership of 76 between Joss Buttler and Alex Hales pulled the Englishmen out of the slump. Hayes scored 40 while Buttler top scored with 67 before Santokie struck again shortly after he was recalled into the attack late in the England innings. Santokie, who was named man-of the match, had Buttler caught while attempting a big shot and removed Ravi Bopara for 14 to finish with figures of four for 21, his best T20 figures. Dwayne Bravo picked up two wickets for 34 runs. Buttler and Bopara had also teamed up for a 5th wicket partnership that produced 35 runs. Earlier, Chris Gayle put on an opening stand of 48 with Dwayne Smith and led the West Indies scoring with an entertaining innings of 36 which included a four and four sixes. Three of Gayle’s sixes went flying onto the roof of the stands and out of the ground. 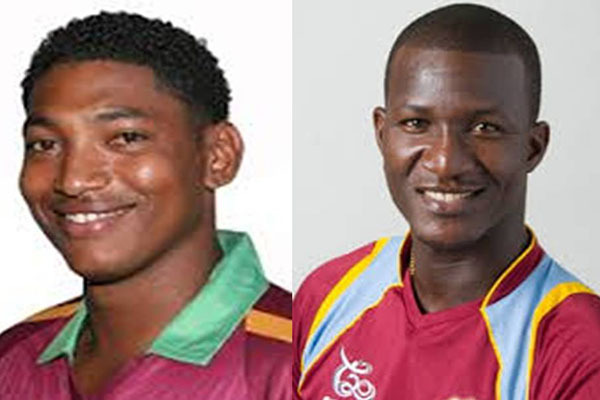 Smith scored 30, Marlon Samuels 28 while Lendl Simmons scored 19 from 13 balls. West Indies who were coasting along at 111 for three, lost two wickets in two balls as Tim Bresnan threatened to derail their chase. Bresnan dismissed Samuels then Andre Russell to leg side catches forcing Sammy to step up on arrival to play a captain’s knock batting alongside Dwayne Bravo. West Indies found themselves needing 30 runs from three overs and then 9 runs from nine balls for victory before Sammy exploded. The West Indies captain was particularly severe on Bresnan hitting him for two sixes and a winning boundary in the penultimate over to seal the series. West Indies and England play the third and final T20 on Thursday. England Innings: 152/7 (20 Overs). Jos Buttler+ 67, Alex Hales 40, Ravi Bopara 14, Tim Bresnan 7; Krishmar Santokie 4-0-21-4, Dwayne Bravo 4-0-34-2, Samuel Badree 4-0-16-1, Andre Russell 2-0-13-0. West Indies Innings: 155/5 (18.5 Overs). Chris Gayle 36, Darren Sammy* 30*, Dwayne Smith 30, Marlon Samuels 28; Tim Bresnan 3.5-0-51-2, Ravi Bopara 4-0-10-1, Jade Dernbach 3-0-30-1, Luke Wright 2-0-20-1.